Scholars across the world marked the death of Giulio Regeni today — the Cambridge University PhD student who was tortured to death in Cairo, after disappearing on the fifth anniversary of the Egyptian revolution in January. While a funeral was held in his hometown of Fiumicello, in Italy's northeast, friends and former colleagues simultaneously gathered outside the Italian embassy in London, where their remembrance was mixed with calls for more British efforts to force a full investigation into what happened. 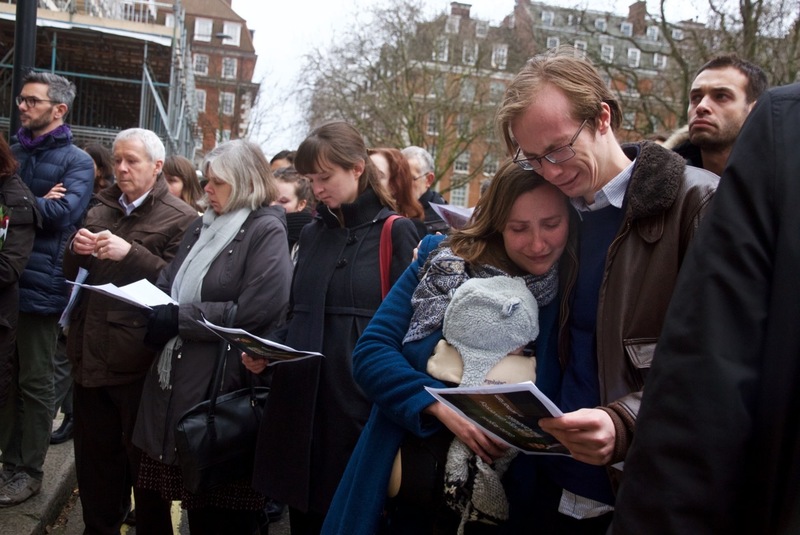 Mourners included students and academics from Oxford, Cambridge, and Leeds universities. Attendees held flowers and photos of Regeni in front of them, and several cried as speeches were made and poetry was read. Hundreds of mourners also attended his funeral in Fiumicello with villagers reportedly offering up their couches and spare rooms for visiting friends to sleep on. Regeni was an award-winning scholar, and a doctorate student at the University of Cambridge, where he had received a bursary. He spoke four languages, including Arabic, and played on a Cambridge basketball team, according to his resume. At the time of his death, he was in Cairo as a visiting scholar at the American University and had been in Egypt since September. Regeni also wrote about his work on Egyptian labor unions for Italian communist newspaper Il Manifesto under a pseudonym, something which was confirmed by Simone Pieranni, the newspaper's foreign editor. The paper said it would be publishing a piece written shortly before his death on Friday. The 28-year-old disappeared on Monday, January 25 — the fifth anniversary of the nationwide protests that ended former Egyptian President Hosni Mubarak's 30-year rule. His body was discovered on February 3, after a public awareness-raising campaign by his family and friends. He was found in a ditch by the Cairo-Alexandria desert road, on an overpass close to Cairo's 6th October district. His body showed clear signs of torture, including cuts to the ears and signs of beatings. Egyptian prosecutors have said these marks signified a "slow death," though investigators initially said what happened was likely a road accident. Italy has demanded a joint investigation into his murder, while Italian Prime Minister Matteo Renzi has warned Egypt that the quality of the investigation into the death would have huge consequences for the relationship between the two countries. "For the moment, all our requests have been met and above all we have demanded that every element should be put on the table in order that the truth can be established and those really responsible can be detained," Renzi told Radio Anch'io. "We have told the Egyptians: friendship is a precious asset but it is only possible on the basis of truth,"
A petition calling for the British government to release a statement detailing the steps they're taking to call for an impartial investigation has been signed by more than 3,400 people. Hannah Waddilove, a former colleague of Regeni's at Oxford Analytica, where he worked for a year, and one of those who set up the petition, told VICE News that his friends and colleagues in Britain were calling for "a UK acknowledgement" of the murder. "Giulio lived in the UK for 10 years, he was a PhD student at the University of Cambridge, and was murdered while undertaking his research, so we feel this is something that the UK government should be paying attention to." She said that other students in the UK needed to know they wouldn't be victims of violence when they travel abroad for university work. Another one of those outside the Italian embassy on Friday was Natalie Cassidy, 26, who lived with Regeni's best friend at Leeds University and studied politics with Regeni. "I've not seen him in a long time but he left an impression on me," she said. "I wasn't very confident when I went to university… and he had time for me, and that's just his character. He had time for people and he's not afraid of challenging the status quo." Cassidy said she's been putting posters up around her neighborhood asking for people to sign the petition. Standing with her was Enrico Russo, 26, who called Regeni an "exceptionally intelligent individual." "He was exceptionally well read and he knew about loads of stuff: any particular topic you could bring up." During their undergraduate year Regeni was already speaking about going into academia and his plans to do a doctorate degree. "He was super PhD material," Russo said. Paz Zárate, a former colleague of Regeni's, was responsible for organizing the memorial on Friday. She said she reacted with "disbelief" when she initially heard the news. "This is a person who never hurt anyone," she said. "For me Giulio represented the best that Italy symbolizes. He had a sunny personality, so when he came into a room he would cheer you up." "He was doing his job," she said. "[Regeni] was equally at home here in the UK, in Cairo, in Italy, in Latin America, or anywhere else." Calling this an "attack on academia and research more widely," Zárate added: "I think it's very important [for the British government] to give a sign that attacks against students at UK universities will not be accepted anywhere, and the UK is prepared to protect staff and students of these universities." Zárate said Regeni was acutely conscious that Egypt is a dangerous place to be politically active and was being deliberately cautious. When she spoke to him before Christmas, he told her the atmosphere in Cairo was "agitated," but he would be safe because he was only doing a few months research work before returning to Cambridge to teach in March. "He was very focused… He was a professional," she said. "The rule of law is not at its best in Egypt. In contrast, the atrocities are well documented." Regeni spent last summer as a visiting researcher at the German Development Institute in Bonn — Zárate recalled they were so impressed by him they offered him a job. She said he was contemplating taking the offer up after his PhD was completed, but had been also exploring the idea of going back to the United Nations — he had previously worked for the United Nations Industrial Development Organization (UNIDO). The Italian ambassador to the UK, Pasquale Terracciano, joined the grievers, standing on the steps of the embassy to offer his condolences. Terracciano said everyone at the embassy had been shocked to hear of the death. "We expect full justice," he reaffirmed. Bernard Goyder, who first met Regeni in Cairo in 2013 while he was studying Arabic , and remained a close friend up until his death, was adamant that intimidation from Egyptian authorities would not have stopped him from carrying out his research. "Giulio knew there were risks to what he was doing but I don't think he would ever have backed down from what he wanted to do. He was quite political in terms of the research he was doing; it was about trade unions, a controversial subject in Egypt. I think Egypt is a difficult environment to be in, it's a dictatorship effectively and both the UK and Italy are close allies of Egypt so diplomatically that's a sensitive issue." Regeni's death has also highlighted the risks many people in academia face when researching in counties with heightened state controls. "Giulio wasn't an activist or a journalist really, he was someone who was doing fairly neutral work," Laurence Blair, a journalist and another former colleague of Regeni said. Jimena Blanco, a political risk analyst, said: "I came here today was because I think his killing was not just a simple murder, it symbolizes a lot more — the killing of freedom of speech, the killing of freedom of movement, and of thought. I think that it represents the struggle of a lot of people right now and the oppression of the regime." Blanco also addressed the need for the international community to understand the significance of Regeni's murder. "Having a service here in the UK shows that Giulio's murder is an issue that should resonate with us, not just the Italian government and not just Giulio's family. We need our governments to make sure that justice is served and that Giulio's case continues to be in the mind of Egyptian authorities." Angelo Martelli, president of the Italian Society at the London School of Economics, told the crowd: "Giulio has paid the price of someone who believed that knowledge had no borders and that academic research — in order to flourish — needs to be truly free." "With Giulio's murder, also academic research has been assassinated because we are depriving academia of its core idea of universities — of a community of scholars without borders… He aspired to be a citizen of the world." On Wednesday, students also held a vigil outside SOAS University in London. More than 4,600 academics across the globe have also signed a letter saying they were "saddened" to hear about the death and "appalled" to learn that there were signs of torture, which they noted Amnesty International says is carried out by state bodies "against hundreds of Egyptian citizens each year." Regeni's death also follows a pattern of forced disappearances and murders in Egypt. In December, the Egyptian Commission for Rights and Freedoms said it had registered 340 forced disappearances within two months in the country — an average of three each day.